Spotify has added 10m subscribers to its service in the past five months – enough to push it beyond the 70m paying customer milestone. The Swedish company, which recently filed papers with the SEC ahead of a direct listing attempt on the New York Stock Exchange, confirmed the figure earlier today. The announcement means that Spotify has managed to add 20m paying subs to its customer base since March 2017, when it officially surpassed 50m. That’s an impressive average addition of 2m subscribers per month across a solid 10 month period. 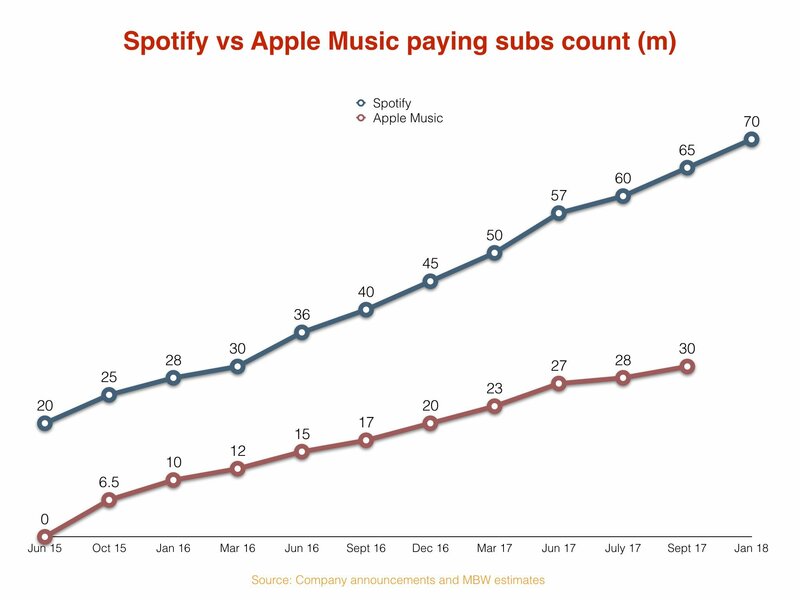 Spotify’s main rival in the music streaming market, Apple Music, is understood to be adding around closer to one million subscribers per month, judging by recent corporate announcements (see below). The 70m subs news is good timing for Spotify, as it hopes to whip up investor excitement ahead of its flotation.